This is the seventh post in the West Coast! A Week in San Francisco and Sonoma Series. Other posts in this series include Sonoma Starlight at Francis Ford Coppola Winery, Sonoma Wine Country Weekend – Taste of Sonoma 2015, Glen Ellen Star Sonoma, Santé Restaurant at the Fairmont Sonoma Mission Inn & Spa, Russian River Brewing Company, and Kin Khao Thai Eatery. San Francisco’s Ferry Building Marketplace is definitely a must-visit for any food lover visiting San Francisco. I first discovered it back in 2009 when I attended Foodbuzz Festival, my first food blogging event. I think fondly back to those early days of food blogging, when the field was relatively new and we were all trying to figure it out. The community was smaller then, and especially strong. I made a lot of really great friends from those early days. It’s crazy to think that despite the fact that I’ve been visiting SF quite regularly, I never got the chance to go back. In fact, I would only hear about the Ferry Building Marketplace from Bryan, who travels to San Francisco a lot. He would make a point of waking up super early the morning before his flight so he could walk to the Ferry Building and pick up a few loaves of freshly baked ACME bread (and maybe some Blue Bottle coffee beans) to bring back to Boston. Finally, during our anniversary trip out to Northern California a couple months ago, we stayed at a hotel that was about a 15-minute walk from the Ferry Building. Finally, I was able to spend several days exploring the shops and restaurants at the Ferry Building. 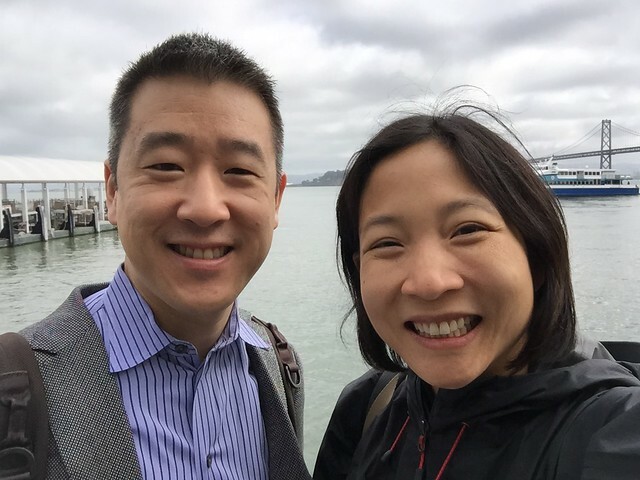 Virtually every morning, Bryan and I walked to the Ferry Building Marketplace to pick up our morning coffee at Blue Bottle Coffee. Be prepared to spend 10-15 minutes in line. There’s always a line. They make every single drink to order, including each individual cup of drip coffee, so it takes quite some time. The resultant coffee is delicious and most definitely worth the wait. They offer all sorts of espresso drinks as well, so on certain days, we’d get cortados (or gibraltars) instead. Blue Bottle is certainly not your only choice of coffee. One afternoon, Bryan and I found ourselves drawn to the nitro cold brew coffee that Four Barrel Coffee was offering outside. If you want food, one of San Francisco’s most well-known bread companies, ACME, has a shop inside the Ferry Building. I still think ACME makes one of the best sourdough breads I’ve ever had, and we always try to bring some back whenever we visit SF. Our ritual every morning was to pick up some bread after we got our coffee. Bryan especially loves their cheese wheel pastry. The Ferry Building houses several excellent cafes and restaurants, such as Boulettes Larder, a Mediterranean gourmet lunch/brunch spot, Hog Island Oyster, seafood place serving local shellfish and beer, Out the Door and The Slanted Door, modern Vietnamese sister restaurants, and Delica, a Japanese deli. One afternoon I felt like something light, so I picked up a salad to-go from Cowgirl Creamery. Another day I met up with a good friend for brunch at Boulettes Larder and was really impressed with the food. The menu was small and the items were simple, but they were made with super high quality ingredients and everything was absolutely delicious. Of course, no one can resist Humphry Slocombe, one of the best and most sought-after ice creams in San Francisco. Humphry Slocombe is known for its ever-changing creative “trend-setting” flavors made with premium ingredients. I was torn, but finally settled on the Secret Breakfast Ice Cream, their most popular and signature ice cream. It consists of a bourbon vanilla ice cream base mixed with crushed caramelized cornflake cookies. I thought the flavors were phenomenal and overall the ice cream was very enjoyable. The texture was softer than my favorite ice cream in Boston (maybe the bourbon makes it melty? ), but it was still very, very good. 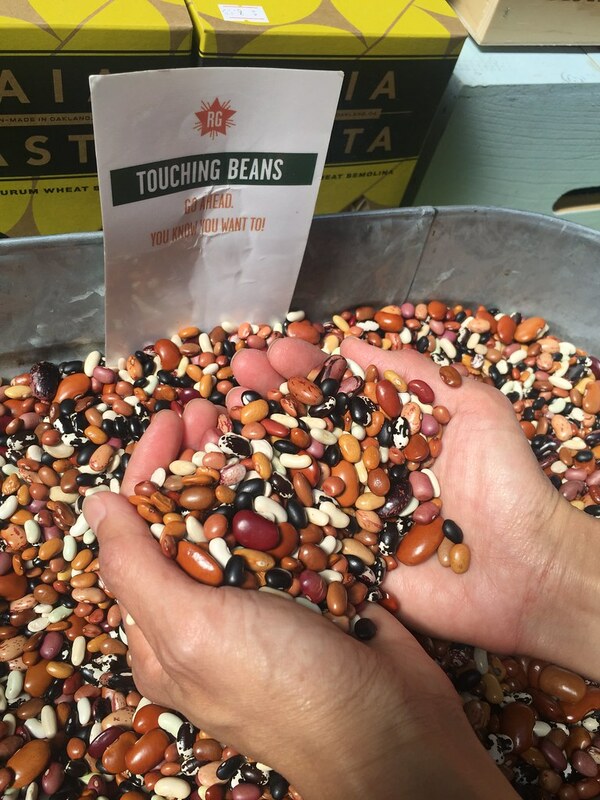 There are a lot of shops that sell market items, like Rancho Gordo Beans (great heirloom beans, which I’ve used before in making chili! 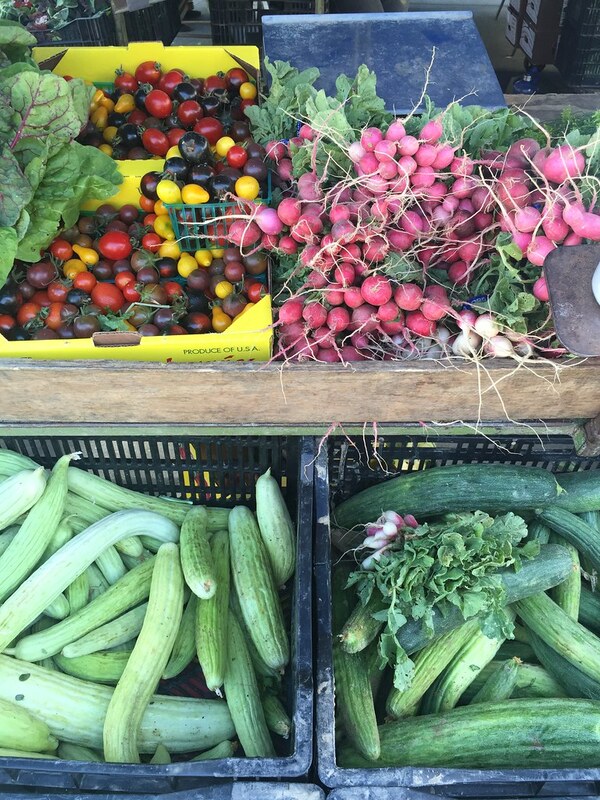 ), and lots of gorgeous fresh produce. Three times a week (Tuesdays, Thursdays, and Saturdays), a farmers market pops up right outside the building, which makes wandering around even more fun! There are also non-food related shops, like this pottery shop called Heath Ceramics. I fell in love with these gorgeous Sausalito-made vases, which I so wanted to take home (but I exercised discipline and did not let myself buy any!). Even if you’re not into shopping or eating, you can still walk out back and enjoy the views of the water and bridges. Or you can actually buy tickets and take the ferry somewhere! 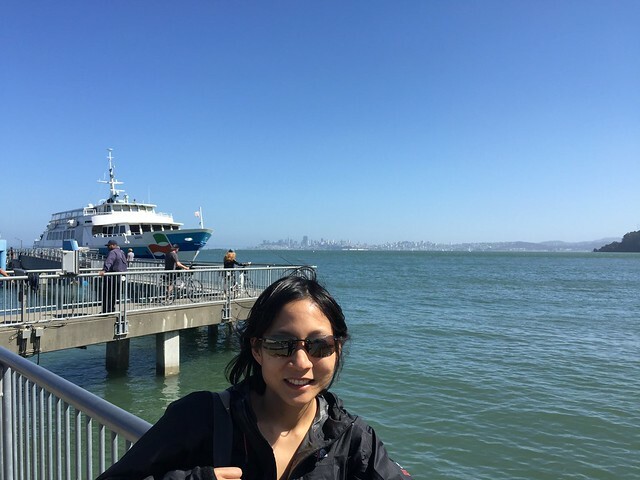 I met up with a friend and took the ferry to Sausalito for a lovely day trip. 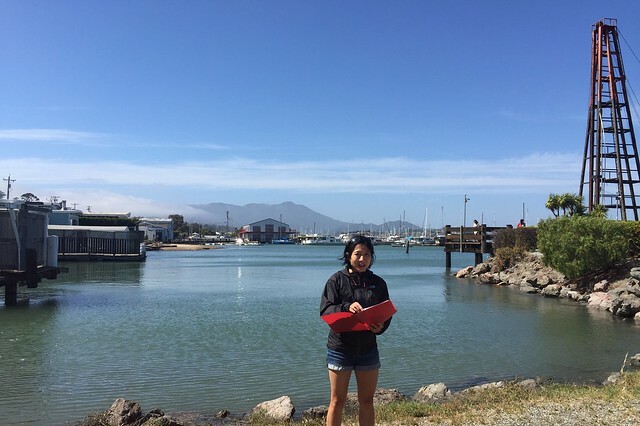 Sausalito – isn’t it so picturesque? The Ferry Building Marketplace is a fun place to visit for all sorts of local, San Francisco products. It’s a great place to find unique, locally-made food-related (and even non-food-related!) souvenirs to take home. I’d highly recommend visiting! Great post! I’m planning a trip to SF in a couple of months – I haven’t been there in years and our hotel is near the ferry building so I’m super excited!